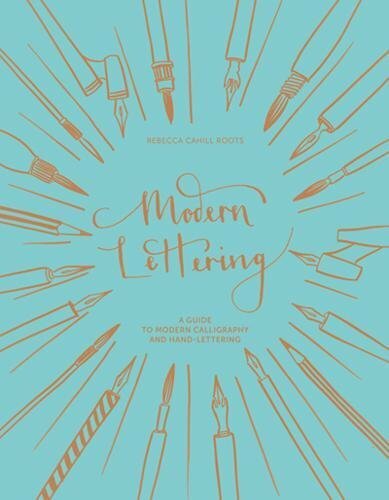 Modern Lettering by Rebecca Cahill Roots is a quick and casual guide to modern calligraphy. This 192-page hardcover book is split into three parts. The first part has the introduction and talks about the tools you'll need, basic maintenance for dip pens and preparation. The second part has the instructions and blank pages where you can follow along to practice and write inside the book itself. And the last part shows you the different applications of handwriting, such as for writing letters, banners and for other creative means. Modern calligraphy, to put in simple terms, is basically writing in cursive and have the letters string together. It's a very casual writing style that's not very strict or formal looking compared to other styles, like Gothic, Copperplate or Spencerian. Other than stringing your letters together in cursive, there are also some creative lettering examples. This book is good for those who want to add some flair and style to their writing. The exercises and examples are actually quite simple to follow along. Beautiful results are not too difficult to achieve. Should you want to bring your calligraphy to the next level, you can then consider studying the more traditional writing styles.